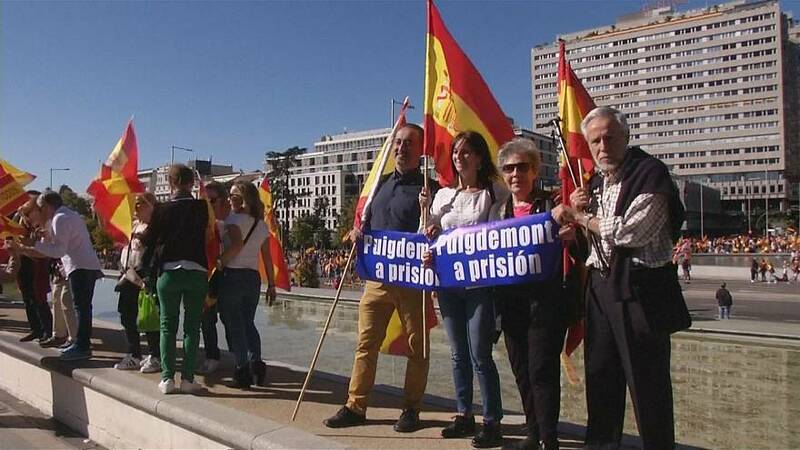 About 1,000 pro-unity supporters gathered at Madrid’s Plaza Colon (Columbus Square) on Saturday (October 28) waving flags and voicing support for the central government as Madrid took control of the autonomous region of Catalonia to block its push for independence. Madrid dismissed the Catalan government, took over the administration and called a new election after the region’s parliament declared independence on Friday (October 27), in a bid to draw a line under Spain’s worst political crisis in 40 years. The independence declaration, though dramatic, was almost immediately rendered futile by Spanish Prime Minister Mariano Rajoy’s actions. Other European countries and the United States also rejected it and expressed support for Spain’s prime minister. The new regional election will be held on December 21. But it is not certain whether this can resolve the crisis as it could increase the numbers of independence supporters in parliament and take things full circle.